A group of Arkansas PROMISE youth attend summer camp in 2016 . 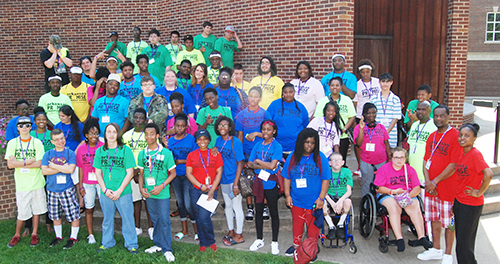 PROMISE staff work with youth with disabilities to help them be successful at two paid summer work experiences, and they also work at the weeklong camp, which focuses on college and career readiness as well as fun activities. A uniquely experienced pool of people will enter the workforce this October from the University of Arkansas. Many have as much as five years of experience working in a program serving youth with disabilities and their families. The Arkansas PROMISE project is wrapping up its five-year research project later this year, and about 100 PROMISE employees will be seeking new jobs. The PROMISE project began in 2013 and was funded through a $35.7 million grant from the U.S. Department of Education. Robin Freeman, director of CURRENTS, which is a partner in the PROMISE project, said these employees have expertise in multiple areas. These include public administration, social and human services, higher education, health and wellness, therapy, human resources, project management, mental health and counseling, leadership development, nonprofit management, and small-business ownership. The staff members hold bachelor’s degrees, and some have master’s and doctoral degrees. CURRENTS specializes in providing training and other professional development to people who work with people with disabilities. Its semi-annual staff development sessions for PROMISE have included poverty, case documentation and management, ethics and confidentiality, and strategies for building relationships and trust. Philip Adams, director of PROMISE, wanted to be sure PROMISE staff have access to resources and tools to help them secure new positions. So, the PROMISE leadership team decided to hold a career fair in Little Rock that CURRENTS is organizing. Employers from across the state will be on hand from 9:30 a.m. to 12:30 p.m. Thursday, May 10, at the Marriott of Little Rock to speak with Arkansas PROMISE employees and take job applications. PROMISE provides two paid summer work experiences as well as additional training and intensive support services for a group of 1,000 teens who receive Supplemental Security Income. Each work experience is about 200 hours. A second group of 1,000 teens, the control group in the study, receives only the usual services provided to youth with disabilities. PROMISE is an acronym for Promoting the Readiness of Minors in Supplemental Security Income. The underlying premise of PROMISE is that improved coordination between services can improve outcomes for youth with disabilities and their families. Its goals also include decreasing reliance on SSI and reducing the cost to the federal government. Researchers are collecting and analyzing data from the two groups to help the federal government determine whether the PROMISE project should be used as a model for future programs. Brent Thomas Williams, an associate professor of counselor education and principal investigator of PROMISE, said a recent federal law known as the Workforce Innovation and Opportunity Act requires various state agencies that serve people with disabilities to put greater emphasis on the school-to-work transition of youth. That’s exactly what PROMISE excels at, Williams said. PROMISE has affected systems change, Williams said, and the new federal law is one example of the government implementing the work of PROMISE. Arkansas was one of five individual states, plus a consortium of six states, that received the PROMISE funding from the U.S. Department of Education. CURRENTS stands for the Center for the Utilization of Rehabilitation Resources for Education, Networking, Training and Service. It is also based in the College of Education and Health Professions. CURRENTS, which has participated in PROMISE from the beginning and helped write the grant proposal, has been responsible for all monthly training sessions for the youth and their families as well. The curriculum focuses on financial literacy, benefits planning, setting goals and “Seven Habits for Highly Effective Teens.” CURRENTS also played a pivotal role in the implementation of the Arkansas PROMISE summer camp that focuses on college and career readiness, social and emotional learning, and healthy relationships. Employers who would like more information about the career fair can contact Kristin Thompson at 501-623-7700 or kthompson@uacurrents.org.